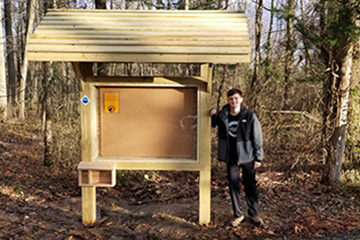 Our Fox Hill Preserve in Tewksbury Township is a more welcoming place for outdoor lovers, thanks to a pair of Eagle Scout projects recently completed by 17-year-old twins Henry and Stuart Fechhelm of Mendham. 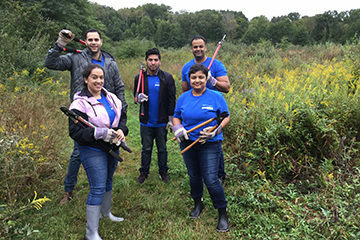 Henry cleared, widened and marked existing trails at the 58-acre preserve, and gathered a team of volunteers to help him create new trails. He also used a Global Positioning System (GPS) device to document the exact locations of trails, which allows us to create an accurate new trail map. Stuart created the Preserve’s first off-street gravel parking area, a project that involved clearing brush from the land, grading it to meet local construction code, securing donations of stone and landscape fabric, and arranging for volunteer labor and borrowed equipment. Henry and Stuart are juniors at Mendham High School and members of Boy Scout Troop 150 of Bernardsville. They will receive their Eagle awards at a ceremony in June. “We’re happy to make it more accessible and inviting to the public,” agreed Stuart. 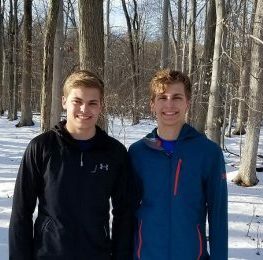 The Fox Hill Preserve work was suggested to Henry and Stuart by Heather Gracie, the mother of a fellow troop member and a former Raritan Headwaters trustee, after they expressed interest in working for an environmental or conservation organization. The brothers liked the idea, so they followed up with George Schaberg, our land projects manager, who gave them a list of projects that needed to be done. Henry chose trail improvements, which he completed last fall. He and his volunteers cleaned up and widened existing trails, added a half-mile of new trail to complete a loop pathway, blazed the trails with markers and mapped the trail locations on GPS. Stuart took on the task of building a 2,400-square-foot gravel parking lot for the preserve so visitors no longer have to park on the road. He and his volunteers cleared brush, leveled the land, placed landscape fabric over the soil to prevent weeds from growing. 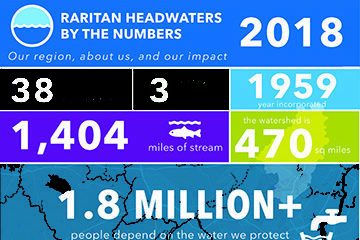 Stuart was fortunate to get considerable help from local businesses. The Stavola Quarry in Bound Brook donated and delivered the gravel, Hoffman Supply in Long Valley donated the landscape fabric, and a local contractor donated the use of equipment to compact the gravel. “We were able to do the project for only $70, so I was very happy,” said Stuart, noting that the parking lot otherwise would have cost about $15,000. As Stuart and Henry were finishing work on the parking area, a woman rode up on horseback and asked their father what was going on. He told her about the Eagle Scout projects. Henry and Stuart are the sons of Lisa and Paul Fechhelm. After high school, Stuart aspires to a military career and is hoping to attend the U.S. Naval Academy. Henry wants to pursue a career in engineering and hopes to attend Cornell University.